My husband raises his eyebrows when he sees a shoe bag in my shopping cart. He has good reason to, since I put them all over the house, on the backs of doors, in my quest for organization. I’m running out of doors though, so he can rest easy. I just love how functional they are with all the little pockets to store and sort little things so you can easily see everything, instead of things being buried in a cabinet or closet or bin. I use one in my daughter’s room on the back of her door to sort out hairbows by color and to sort out ribbons and barrettes. I also use one in my closet and our hall coat closet for their intended purpose, shoes. On my pantry door, I use one to organize some of the little things that can get lost elsewhere and some of the kids’ snacks so they’re easy to get to. 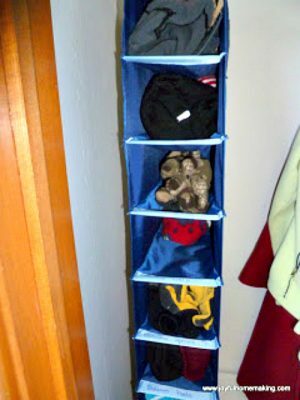 This narrow shoe bag works great in my coat closet, as it gives each family member 2 cubbies for their hats and gloves, and I’ve labeled each divider with a Sharpie marker so everyone knows where to put their belongings. 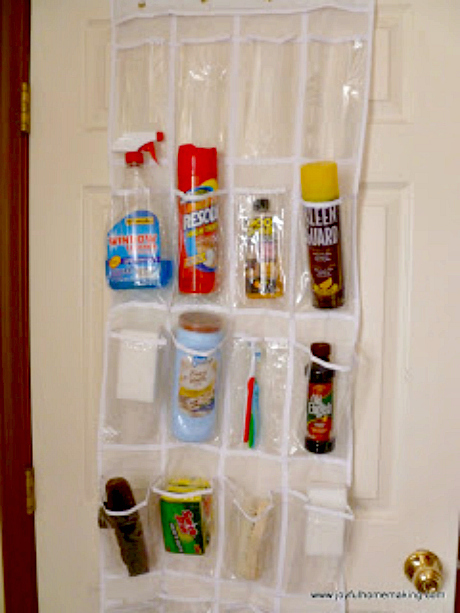 A shoe bag on the back of a laundry or utility room door is handy for holding cleaning or laundry supplies so they are visible and organized. If you have small children though, make sure any poisonous items are safely put away, and out of their reach. Hope you find some helpful ideas! Awesome!!! I love these ideas!! 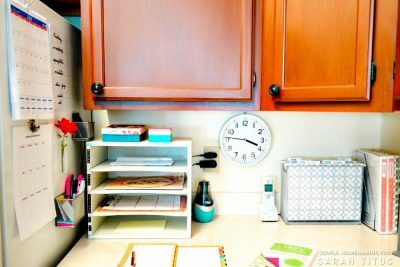 I use to have one to keep my craft supplies organized…never thought to use for pantry! I’m a new follower and I would appreciate if you could follow me back. Great ideas! 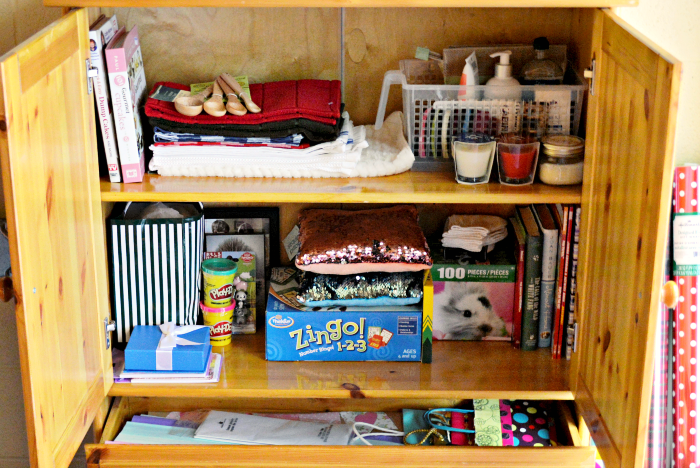 I could really use some extra organization in our pantry and craft closet. Wow your super organised. Good ideas thanks. I can see your husbands face at the store and that made me laugh!! 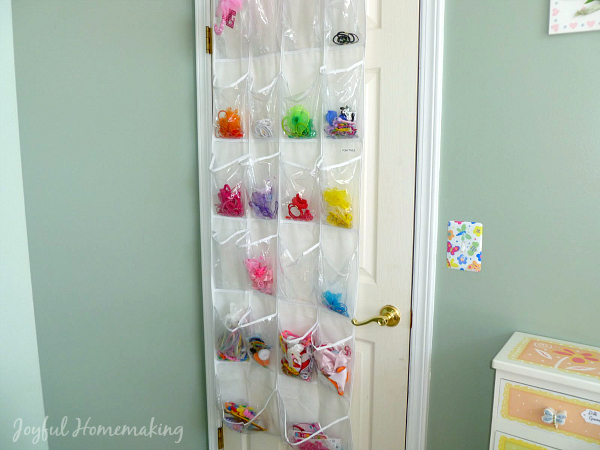 Wonderful organizing ideas, especially your daugher’s door! Those little clips and hair accessories can be maddening when they seemingly join forces to tangle up and take over a bathroom cabinet!! I love these ideas! I use a shoe bag for my craft supplies and it works great.. looks like I’ll have to get one or two more! I love your site too.. found you through the blog party and hop and I’m now following 🙂 Have a great week! 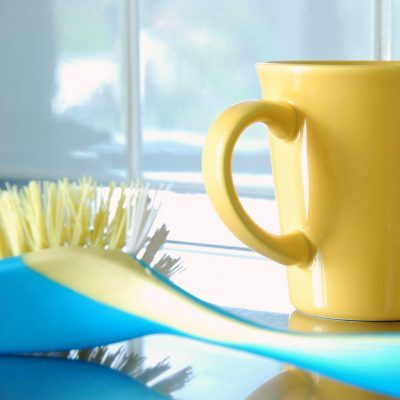 Awesome uses for these! Love it! These are some great ideas. I use one for lingerie items. I was tired of messing up my folded slips every time I was looking for one with the right length. I roll them up and keep in a shoe caddy, being clear I can see the color of the slip and place them in by length, shortest on top. I roll up tights and put them in the lower pockets. Thanks for sharing! Great tips. I definitely could stand to be more organized. It’s funny because I never would have thought to use a shoe bag in a kitchen, but now it seems to be the perfect solution. All those soup packages, flavor mixes, popcorn bags, etc. need a place to go. Awesome idea. i like that idea for the pantry! 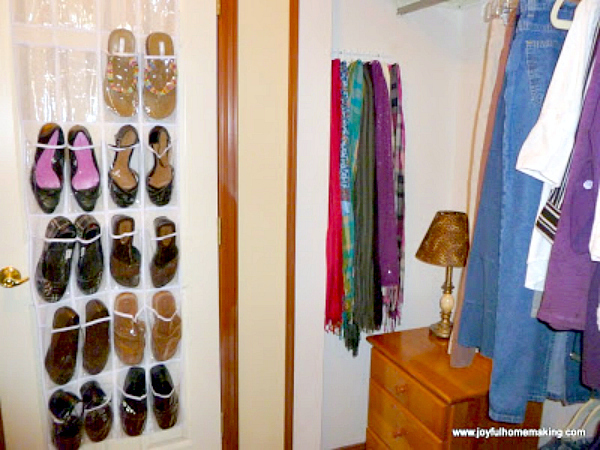 i dont like the racks i have behind my door right now I just might have to try this idea! I love this idea and can think of several places we could use it. Thank you for sharing. I love using these over the door shoe organizers. Thanks for linking this up to my link party. I’m going to feature this post tomorrow. Wow, so many great ideas. I love organization! 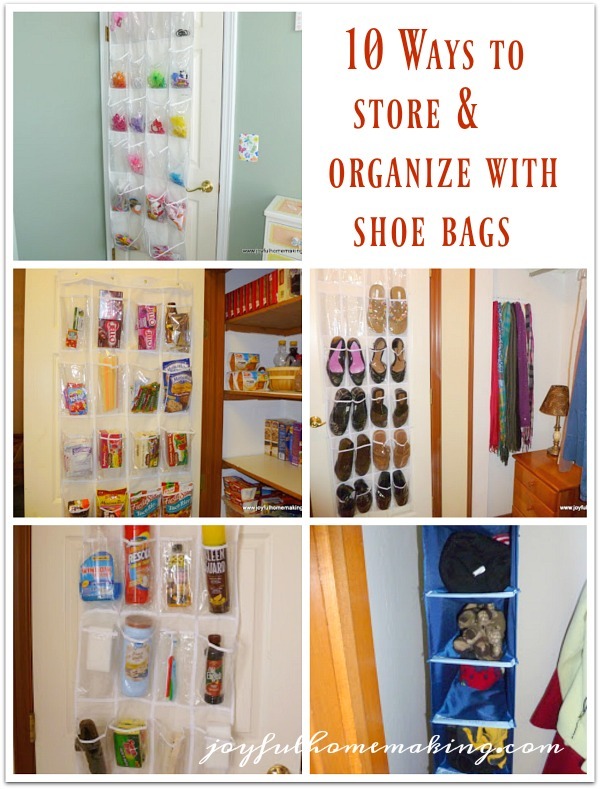 🙂 I love your ideas for using shoe organizers for the pantry,e etc. Thanks for sharing at oopsey daisy! I just found you from this post being featured. Great ideas! I need to use shoe bags more often, who knew they could be so useful. The pantry idea is genius!! I’ve got to see if I can do that in my kitchen. 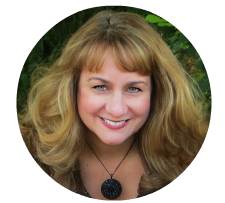 I’m a new follower to your blog; you’ve got some great ideas here. I was organizing my bathroom the other day and thought about getting one for my shower to hold dh’s razor, shaving cream, ect. i am going to cut tiny slits in the bottom so the water will drain out that gets in there. 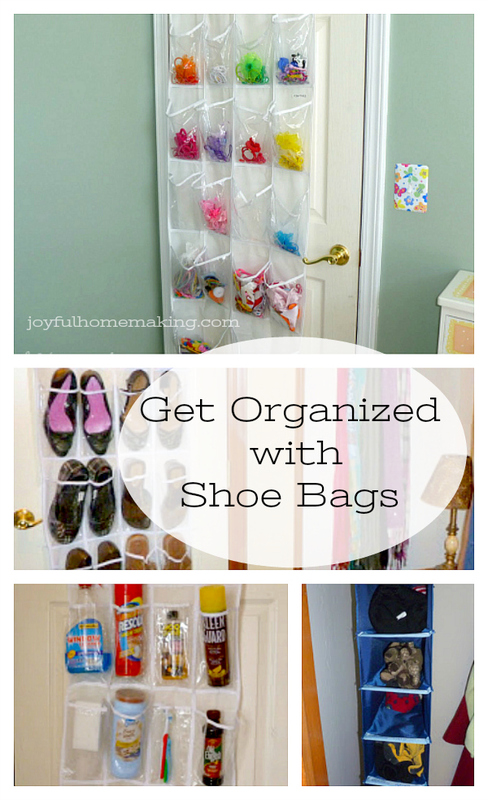 shoe organizers are great for all kinds of places. Laundry Room, garage, barns, I am needing one for my chick room in the barn to keep up with all the small things I have. kids rooms, office just a few places.